One of the hidden treasures of the city of Safed is a plain-spoken, humble Chassid who calls himself simply, Reb Moshe. 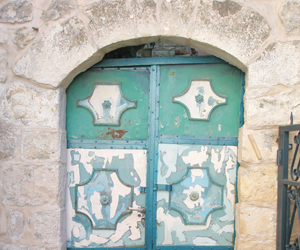 Without any fanfare, Reb Moshe embarked on a project to film all of the many Jewish holy sites, including famous graves, in Safed and in all of northern Israel. In these 350 video clips, Reb Moshe is seen and heard telling stories and giving practical advice. Many of the clips have exceeded their status becoming actual short films, with not a few having received a professional edit. Reb Moshe calls his project, "I Love Torah," and his clips appear on many venues, including: http://www.youtube.com/user/ilovetorah and www.torahvideo.com . A search at www.google.com brings up even more of Reb Moshe's voluminous film work. In all, the films have received over one million views and there are hundreds of comments registered on the youtube site. People want to see the films because they intend to travel to the area and need sound advice on how to get there and what to see. The films and clips are so affecting that many viewers decide to immigrate to Israel after viewing them. The presence of this unusual fellow is felt elsewhere as well. At www.myspace.com/ilovetorah, Reb Moshe has attracted over 12,000 myspace members. People want to befriend Reb Moshe because he teaches from Safed, a holy city that tends to attract those on a spiritual sojourn. Facebook, another popular social networking website is a rather new venue for Reb Moshe, who has already attracted a following of 970 Facebook friends to date. Reb Moshe and his wife Rochel Faiga also feed many guests at their Sabbath table and estimate they've hosted some 350 guests. Reb Moshe's way is to have a small shot of whisky and allow the kids to ask him a question on any subject from Chassidut to Kabbalah. These impromptu question and answer periods sometimes last until 3 AM. The couple is now at the top of the city lists for likely Sabbath hosts and Reb Moshe and Rochel are always willing to take in, "just one more guest." Reb Moshe's hope is to reach disaffected Jewish youth and adults and help them to find meaning through his outreach. To that end, Reb Moshe's presence can also be felt at www.ilovetorah.com, www.askreb.com where he answers questions on just about any topic you can think of, and at the www.ilovetorah.com/blog where he posts his thoughts on a sometimes hourly basis. Reb Moshe hopes and dreams he might one day open an institution of Torah learning, which will, of course, be named, I Love Torah. The man succeeds in reaching people because he sees each person's unique qualities, sees each person as special. There is no coercion in his warmth and openness; it's just love, with no strings attached.